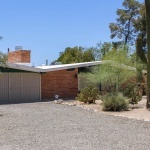 This remodeled home at 7565 N San Lorenzo Dr. Tucson AZ is a mid-century modern home in the northwest area of Tucson. The home provides the buyer 3,122 SF of living space. The main home has 2,212 SF and the spacious guest house has 910 SF. Sitting on almost an acre across the street from Cross Middle School. The large lot is home to mature saquaro cactus, trees and desert vegetation. The side yard has space to park an RV or travel trailer for those weekend get away. A large screened in breeze way between the main home and the guest house is a perfect place to spend cool evenings. A community pool is a few minutes walk south on San Lorenzo. Or drive and stay cool before you plunge into the pool. Pool membership is on a voluntary basis. The secluded setting feels as if you are in a rural area outside of Tucson. But this home is minutes from Whole Foods at Ina and Oracle and the restaurants in the Casas Adobe Plaza. For More Information – Go Here! Now, what else could you ask for? 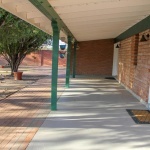 A beautiful Ranch/Territorial home in the Casas Adobes area of Northwest Tucson. Near shopping, restaurants and grocery stores. Want more information or to schedule a showing to see this home at 7565 N San Lorenzo Dr. Tucson AZ? Call us – 520-940-4541 OR Submit Our Contact Form and we will get right back to you. Are you thinking of buying a home in SaddleBrooke or another area of Tucson? Finding the right home can be a challenging process. But we can make the process much less stressful for you.